In this first of three posts, I’ll discuss the lower lip and its role in tone production. Ever had chapped lips? The surface of the lips frays and dead skin peeling causes the lips to feel fuzzy and flaky. Even on a day when the lips are not chapped, the outer edge of the lips is still rougher than the inside edge. A trained embouchure will expose more of the inside of the lip by rolling it outward. This, in turn, means that the corners of the mouth must pull the lip a bit more taut. The result is a smoother surface for the airstream to pass over. The best way to evaluate this (or any) aspect of your embouchure is to look in a mirror while playing. The primary characteristic I look for in students is contact between the lower lip and the lip plate. You should see the lower lip contacting the lip plate on either side of the embouchure hole. 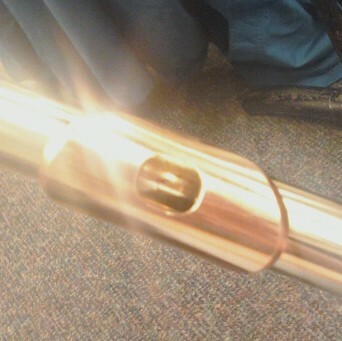 This is a typical flute embouchure. It’s nice, but not much of the lower lip is contacting the lip plate. It also tends to play sharp. More lower lip is contacting the lip plate. More of the smooth inner surface is exposed. Corners of mouth are directed downward. It’s important that the corners of the mouth engage, usually in a backward or downward/frowning motion. Leave smiling to the vocalists. On flute, smiling will pull the lower lip up and away from the lip plate, which is the opposite of what we want to achieve. Double-check lip plate position. Many players place the lip plate slightly too high on the red part of the lower lip. Using the mirror, make sure the edge of the embouchure hole contacts the face at the point where the chin skin meets the red part of the lower lip. If you find your placement is indeed a bit high, and you make this adjustment, it’s possible that at first, no sound will come out. That’s OK! If that happens, keep the new placement while trying the tips above. Placing the lip plate at this point on the face will require you to use a better embouchure. When working with students on this aspect of playing, it only takes a couple of minutes before sound is again produced, and it is always a higher quality sound. 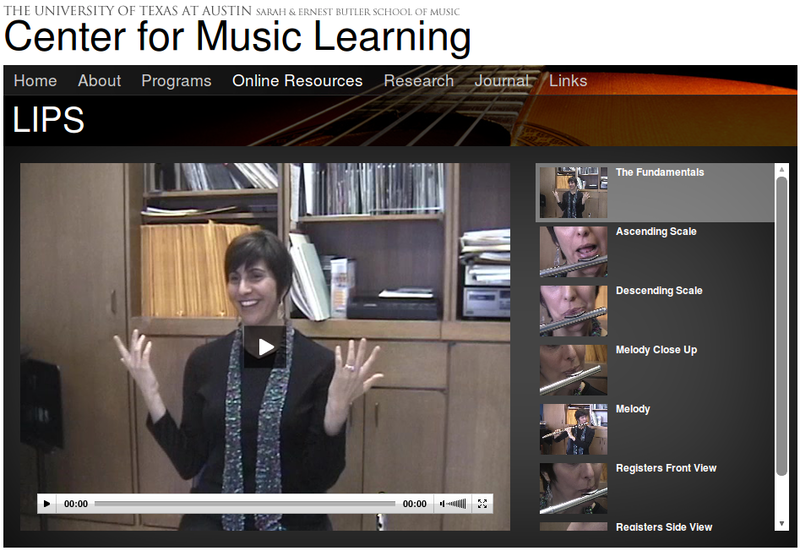 The University of Texas at Austin’s Center for Music Learning has some in-depth videos on embouchure. Professor of Flute Marianne Gedigian provides the flute embouchure demonstrations. Videos vary in length, so even if you’re short on time, you can still watch a short video and walk away with a better understanding of sound production on the flute. I finally put up the first sets of flute/piccolo embouchures on Flickr. Check out my photostream to see pics of different flutists playing in the low, middle, and upper registers. So far I have 5 different players and I’m looking forward to adding more in the future. These are all players with at least several years of experience who are getting a decent sound. Everyone’s mouth and lips are different, but there are a few basic principles of embouchure. For the low register, the bottom lip is drawn back (corners frowning), and the airstream is directed somewhat downward. The bottom lip moves slightly forward for the middle and upper registers and the air is directed more across the headjoint. The higher the note, the smaller the aperture. Do not pinch the lips in the high register! Instead, relax the mouth and produce high notes by supporting from the diaphragm. If you think of the syllables “ah” or “oh” while playing, your tone will have a fuller, rounder quality. Do not press the lip plate [of the flute] hard against your lip. Remember that any tension in the mouth, lips or throat will result in an ugly, choked tone. I forgot to mention in my previous entry that these excerpts are taken from a handout Ann uses when she gives workshops.